MerchantCircle | Blog: Funniest Business Picture Ever! I am a big fan of humor and of people who are willing to make themselves look silly for the happiness of others. So when I came across this picture of a plumber in Halifax, Nova Scotia, Canada, I had to find out if this was a real picture or not. It is. 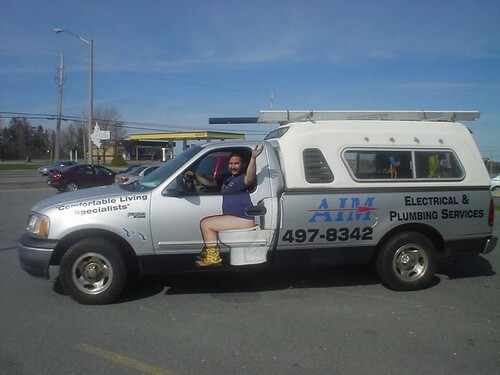 Take a look at the truck for AIM Electrical & Plumbing Services. Attention-getting, to say the least. Makes me think of a sign I saw a couple of years ago that was in front of a bar -- they were advertising their "locals night" with " 1/2 price beer, free munchies, and free poo" Guess the "l" fell off of the word "pool," but that night, there was a line out of the door for that free "poo." I always knew the beach can be a wierd place to live. Love it anyway. "Free" anything at a bar is always cause for celebration! Which beach did you live by? I went to college down in San Diego, so I know the value of free poo! I love it, That would be a double take as you are going down I-40,and see a guy setting on a pot.